As part of PacTrans’ outreach activities, PacTrans started a summer intern program in 2013 to attract talented high school and college students to work and study on transportation related issues. The first two students recruited to this program were Kevin Yang, an incoming high school junior at the Lakeside School in Seattle, and Jinglan Wang, an incoming sophmore at Wellesley College. Both students had demonstrated their talents by winning numerous awards in mathematics competitions. Particularly, Kevin won the 3rd place in Mathcounts National Competition in 2011 and received honorable mentions in both the United States of America Mathematical Olympiad (USAMO) 2013 and the United States of America Physics Olympiad (USAPO) 2013. Additionally, Jinglan is a talented athlete who won 4th place in the U.S. Rowing Youth National Championships in 2012 when she was captain of the Lakeside School’s crew team. 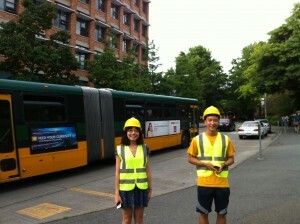 The two interns worked closely together at the Smart Transportation Applications and Research Laboratory (STAR Lab) of the University of Washington over the summer and produced an Android phone app called Seattle Bus Buddy (available for download at the Google Play Store at https://play.google.com/store/apps/details?id=com.starlab.busbuddy). The idea for Bus Buddy was born when Jinglan continuously napped through her bus stop, much to Kevin’s amusement. They decided that many Seattleites likely faced a similar issue and set to work. The application they created allows users to set a GPS enabled alarm for their respective bus stops so that those who tend to miss their stop for various reasons will no longer worry about it. This application is meant to benefit all public transit users, especially those who are visually impaired. With data support from Sound Transit, the pre-installed accessibility options on the Android phone allow the user to navigate and utilize the application conveniently. They hope that hey can someday develop an iPhone version of the application, or that the open source app will capture the interest of other developers who are willing to optimize it for various cities and languages. 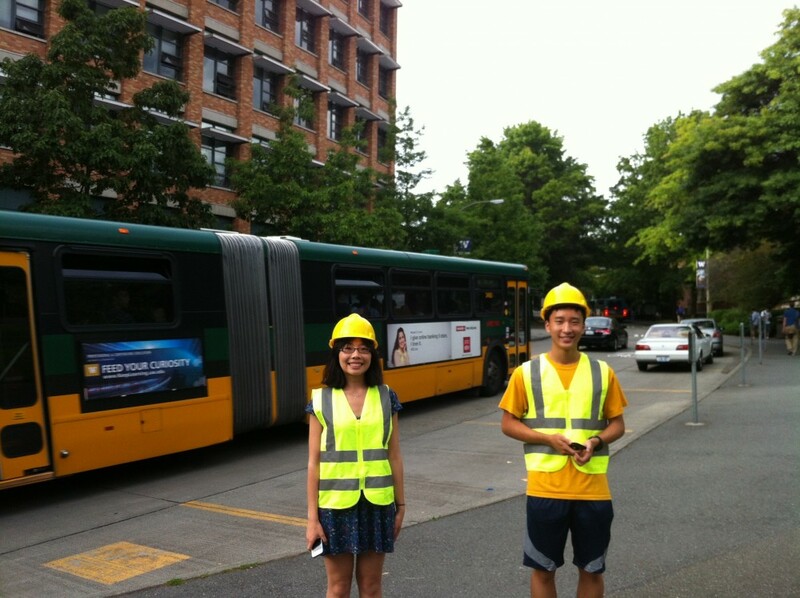 For more information about Seattle Bus Buddy or about interning at PacTrans, please contact pactrans@uw.edu. Save the Date: PacTrans is organizing a Region 10 Student Transportation Conference on Saturday, October 19th on the UW campus in Seattle, Washington. Please register online (and choose the student conference) as an option. *Please note that students attending the Region 10 Student Transportation Conference on Saturday, Oct. 19th at the UW are also welcome to attend the Region 10 Transportation Conference on Friday, Oct. 18th. Cathy Liu, a PhD student in the STAR Lab, won the ITE’s 2012 Daniel B. Fambro Student Paper Award. Her paper was selected as the best student paper by the Western ITE last month and will be advanced to compete for the national award. The Daniel B. Fambro Student Paper Award is awarded annually for a significant paper prepared by a student member of the Institute. Submissions are evaluated based on originality, significance, scope & format, validity, and applicability. Mr. Runze Yu, a Ph.D. candidate from the Department of Civil & Environmental Engineering, was invited as this year’s Eno Fellow to attend the 20th Annual Eno Leadership Development Conference in Washington, D.C.
Every year 19 top graduate students in transportation-related fields are selected across the nation from a highly competitive application pool and honorably distinguished as Eno Follows. Runze spent an intensive week in early June meeting with top Executive Branch and Congressional officials including the Secretary of U.S. DOT, industry executives, and non-profit leaders to learn how the nation’s transportation policies are debated, adopted and applied on a national basis. Runze was nominated by the Pacific Northwest Transportation Consortium (PacTrans) and he is the manager of the University of Washington STAR Lab under the supervision of Professor Yinhai Wang. Currently, Runze is working on his Ph.D. dissertation exploring a methodological framework to understand the distributive pattern of long distance passenger flows, to facilitate national policy and investment decisions. The Eno Transportation Foundation was founded in 1921 by William Phelps Eno (1859–1945, who pioneered the field of traffic management in the United States and Europe. The Foundation is now a non-partisan think-tank focusing on all modes of transportation with the mission of cultivating creative and visionary leadership and supporting activities in three areas: professional development programs, policy forums, and publications.